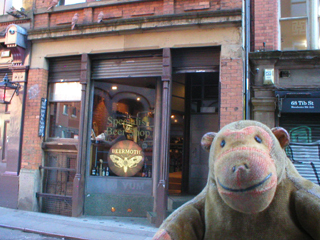 Mr Monkey caught the bus into Manchester and scampered along Tib Street until he arrived at the Beermoth beer shop. He let his humans choose drinks from the well stocked shelves and then led them downstairs to the Tasting Room (or, as it was to be known for the night, The Scary Story Cellar). Mr Monkey and a select group of other people were in the cellar to hear Mr Robert Lloyd Parry reading a slightly abridged version of Sheridan LeFanu's short story The Familiar. This is a rather creepy tale about a man being haunted by a past misdeed, which leads to him being followed by footsteps no-one else can hear, then chased by a figure no-one else can see. It doesn't end well. Mr Monkey had previously seen Mr Parry disguised either as M.R. James or the traveller from The Time Machine. For this more informal performance he just appeared as himself, reading from notes rather than from memory. Mr Monkey was glad to find that Mr Parry reading a creepy story is just as scary as Mr Parry telling a creepy story while being M.R. James. The format also gives everyone the opportunity to talk to Mr Parry before and after the performance, which is nice. The Familiar is one of a number of readings Mr Parry is doing in various small venues. Others include Dickens' Signalman and Doyle's Blue Carbuncle. There's no formal booking process as such; information is supplied by email, and at the end of the reading a hat is passed around the audience for contributions. Mr Monkey strongly suggests that anyone interested in such events go immediately to the Nunkie website and sign up for the email newsletter, which is the best way to find out when and where a reading is to be held. 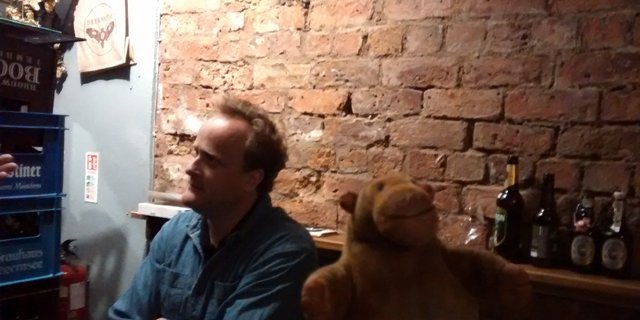 A few weeks later Mr Monkey went to Manchester again, and again scampered down Tib Street to Beermoth. This time he was in the Scary Story Cellar to hear Mr Parry reading The Signalman by Charles Dickens. As part of the reading Mr Parry explained that the story was part of a collection of short stories by Dickens and his friends, set around an imaginary railway station called Mugby Junction and published as the Christmas 1866 edition of Dickens' magazine All the Year Round. Mr Monkey hadn't known this before, and he always likes new information. The Signalman tells the creepy story of a railwayman who, working in a signalbox near the mouth of a tunnel in a deep cutting, recieves unhelpful warnings of disaster from a mysterious figure that stands just outside the tunnel. This story doesn't end well either. Yet again Mr Parry proved that he is an excellent teller of tales, even when the last page of his script has mysteriously vanished. Mr Monkey is convinced that the temperature in the room dropped a couple of degrees at the climax of the story.